With this week’s release of their re-recorded classic debut album Gore Metal, plus a Vancouver show coming up next week on Decibel’s Through Space and Grind tour (alongside veteran acts Napalm Death and Voivod), it’s the perfect time to dig up the past and revisit Exhumed guitarist/vocalist Matt Harvey’s ruminations on death metal. One’s initial reaction to the news that Exhumed had re-recorded Gore Metal was skepticism – would this be yet another reissue in the unending stream of reissues touting better production values (and maybe new artwork or liner notes, when there is room left in the budget)? But this is a death metal recording – it’s supposed to sound like it was recorded six feet underground. Harvey notes that lo-fi, low-budget sound was a common denominator (and desirable excoriation) of early death metal recordings; but a subsequent generation of death metal fans has grown up with all the benefits of digital recording and reproduction: to young ears, the raw sound of death metal’s first wave (1988-1993) is anachronistic. While a savvy genre fan understand that album reissues are a necessary evil to preserve consumer interest in a band – and avid fans gladly support the cycle of consumerism to keep alive those bands about which they are most passionate – “classic death metal” is a misnomer when used in conjunction with the phrase “digitally remastered”. 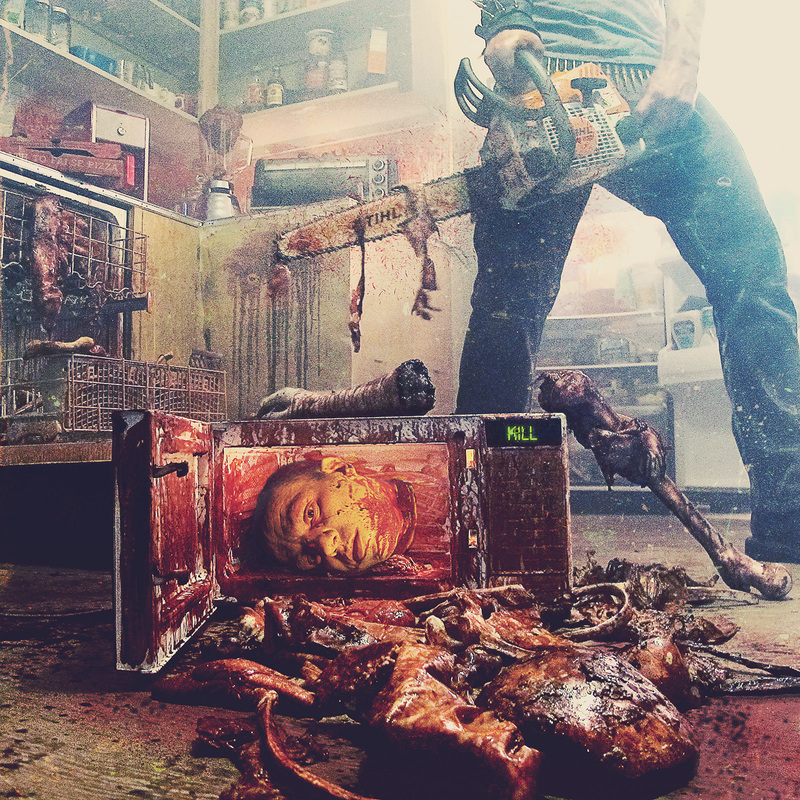 Exhumed: It still ain’t a party without a chainsaw. 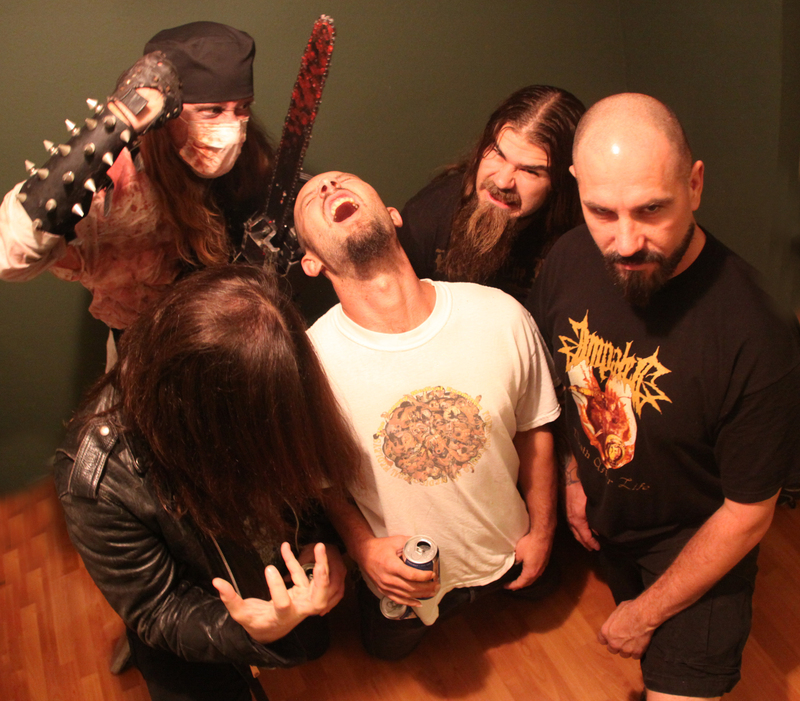 Fortunately the “Necrospective” version of Gore Metal is a wholly new recording that benefits from better production and the sum total of the band’s amassed experience since the original album’s release. While it is ostensibly accepted now that the natural progression in the life cycle of any recording artist – even a genre band with diehard fans of their old, lo-fi recordings – is to inevitably succumb to what Harvey calls “Classic Rock Syndrome” (i.e. when a veteran act releases uninspired albums and continues to tour on the strength of their “classic” songs), Necrospective reanimates the auditory mayhem of early Exhumed without losing any of its ferocity to the precise treatments of contemporary recording methods and standards. Arguably, one of the principal differences between Gore Metal then and now is the changing valuation of media formats. The LP revival of recent years demonstrates a renewed appreciation for physical artifacts that age and wear over time; and, unlike a digital music file, the formats of both LP and cassette are subject to physical wear that is user-specific, and we covet physical artifacts for their impermanence. Like a tree’s rings grow concentrically outward year after year with variations due to the particular and diverse environmental circumstances from season to season, a physical format for music changes the recording with every playback as determined by the listener’s unique circumstances, i.e. the type and quality of playback device used, the care (or negligence) of the user, etc. Physical media provide us with the means to experience the timelessness of a song while retaining evidence of time’s passage – the song may remain the same, but the recording format by which it is contained ages along with us. LPs get scuffed and scratched, cassettes hiss and stutter. Re-recording in the digital era delivers much higher values of sound production and duplication, which extends the longevity of music. Good music is timeless: a song is representative of the era in which it was created, and it has its own contextual relevance to the listener in the present. It’s an oddly sci-fi concept – music as a form of time travel – but as Harvey illustrates, there is virtually no difference between genre fans – metalheads and Trekkies, for instance, are equally passionate about their particular genre, and their enthusiasm and dedication is deep-seated and lifelong. Younger fans want to experience “the classics” with the highest-quality production values, and they want it on physical formats, so that their favourite albums will grow and change with them over time. As metal has evolved over the last thirty-odd years, its legions of fans have grown and become entrenched in their various locales, to the extent that “the scene” in many metropolitan cities has transformed into a functional community, united by the music of the touring bands that travel all over – their own “highway-based” community, as Brian Giles (Red Fang) described it – keeping the music alive. And, as Matt Harvey says, metal fans are in it for life. We aren’t following a trend; it’s who we are, it’s what we love. Gore Metal: A Necrospective 1998-2015 lives up to current standards of production and ensures that new listeners as well as ardent fans will have the opportunity to experience the full sonic bloodbath of Exhumed. Gore Metal: A Necrospective 1998-2015 is available at iTunes.